The year Sam was born I started one of our own Christmas traditions, building an annual Gingerbread House! I used to buy one of the kits at the store and each year we had a lot of fun putting them together then taking pictures for our scrapbook. When I was the lone celiac in the house, (and we still had a dual gluten/gluten-free kitchen) it wasn’t a problem to still buy the kit. Mike and Sam built the gingerbread house and I took the pictures! Gluten House from 2006...yes, we are "artistically challenged" but who cares, it is all about the fun memories! This is the first year that I cannot buy a pre-made kit (since Sam was diagnosed last December and we had already made our 2008 house). I refuse to let this special tradition we have built, and have such fond memories of, die out just because of a “little” thing called a dietary restriction! I came across a recipe for Vegan GF gingerbread cookies from a super cool GF blog that I recently found, Cake and Commerce. 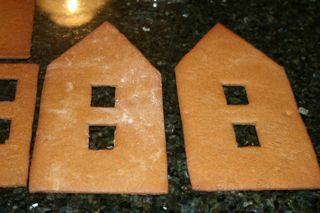 The blog’s author, Linsey, said the dough can be used for building a gingerbread house too. I really like the more unique GF flours that are used in this recipe; (click on the links to read more on these GF powerhouses) like buckwheat, teff and millet. I do not use these flour often, but think I will start playing around with them a bit more…who says the GF diet can’t be uber nutritious?! Preheat oven to 350 (or 325 in Convection oven). Combine shortening, rapadura and maple (or in my case, brown sugar) in the bowl of a stand mixer. Mix with a paddle until light and fluffy. Add in molasses and vanilla and continue to mix. Separately, combine all dry ingredients together. Add to the wet mixture. The dough will be crumbly at first but will soon come together. It may take a few minutes. Finish kneading by hand. The dough can be rolled out right away and cut into cookies or it may sit, wrapped in plastic, in the refrigerator overnight. It may be frozen and stored up to a month. 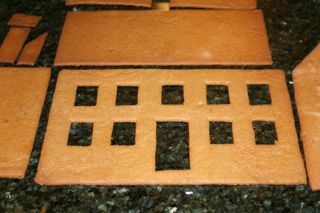 The dough should be very easy to roll out – it does not need to be rolled out between two sheets of parchment. Bake on a parchment-lined sheet pan for 8-10 minutes, or until slightly risen with a touch of color at the edges. Cool. Store in a airtight container for up to a month. I am really surprised at how easy this was!! I really urge you to try it and have some good old fashioned fun! I got a warm and fuzzy feeling of what it must have been like being a mom in my grandma’s generation (she is almost 95)!! This experience made me feel really close to her…(I love you Grams!). Thank you for posting this recipe! Used it to make my first ever gingerbread house. So far so good! Waiting for the icing to dry so the kids can decorate. Will have pictures up on my website later today. I hope.